In March 2016, a traffic stop quickly turned into a violent confrontation with police and a two-day stint in jail for Earldreka White. White, a social worker, was pulled over for allegedly crossing a double white line in Houston, Texas. During the stop, she called 911 asking for police back-up because she felt unsafe. "I would like another officer to come out here," she can be heard saying in the call. "My heart is racing. I'm really afraid." White's lawyer, Zack Fertitta, released the video to the Houston Chronicle. 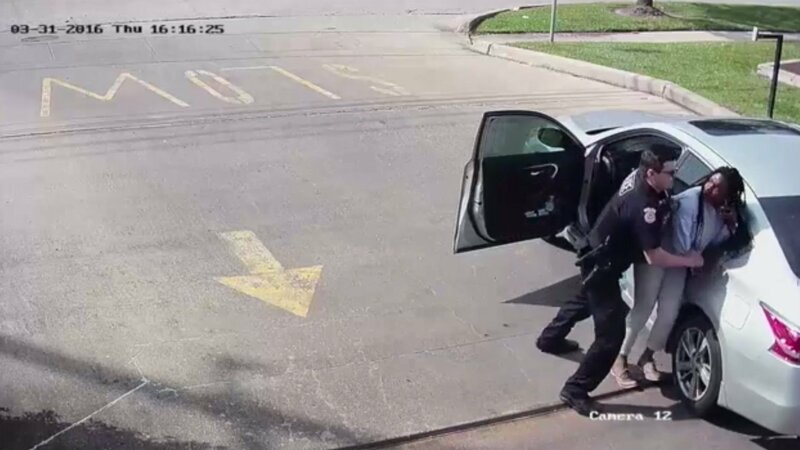 It was captured by a surveillance camera of a nearby business and combined with the audio recording of White's 911 call. "Being pulled over is not the troubling part - what happened after being pulled over is what baffles me," White told the Chronicle. "As I tell the dispatcher that this man is threatening to 'tase' me, he backs away, then comes back and literally tries to break my arm." White exited her vehicle because she believed, at the time, that her purse was in her trunk. She was jailed for two days after being charged with resisting arrest. She was released after posting a $1,000 bail. She and her attorney want the charges to be dismissed. "I'm as pro-law-enforcement as they come, but that's not good police conduct," Fertitta said. "You can't escalate a situation and then claim someone is 'resisting arrest.' That's ridiculous." Official with the Metropolitan Transit Authority said that after reviewing the footage, they found the officer, G. Luca, to have committed no wrongdoing. "She was uncooperative but he did everything reasonable within the law," said Metro Police Chief Vera Bumpers. "He explained what was going on, what the violation was and that he was focused on her safety, as well as his." Bumpers does, however, acknowledge that the officer could have handled the situation differently. "She was just that upset, she just wasn't listening at that point," Bumpers said. "The lesson learned was that we could have been more patient and waited until someone got there who she might have been more comfortable with." The Harris Country district attorney is now looking into the matter.